What Day Of The Week Was August 2, 2011? 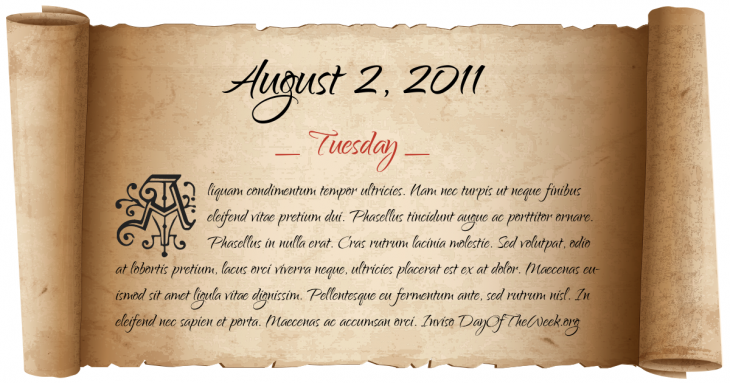 August 2, 2011 was the 214th day of the year 2011 in the Gregorian calendar. There were 151 days remaining until the end of the year. The day of the week was Tuesday. A person born on this day will be 7 years old today. If that same person saved a Half dollar every day starting at age 5, then by now that person has accumulated $495.50 today. Three Rapid City, South Dakota officers stop a group of suspicious people on Anamosa Street. One man pulls out a revolver and fires six shots, killing one officer, mortally wounding another, and injuring the third.